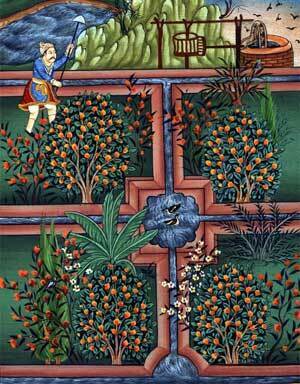 The Bagh-e Vafa (Garden of Fidelity) was Babur's first garden. It was a charhar-bagh. 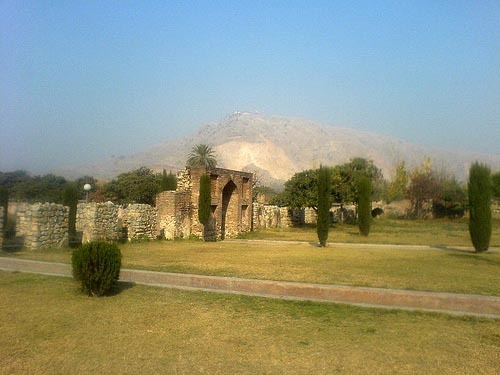 He wrote in his memoirs that 'In 1508-09, I had constructed a charbagh garden called Bagh-i-Wafa on a rise to the south of the Adianapur fortress. It overlooks the river, which flows between the fortress and the garden. It yields many oranges, citroens and pomegranates.' 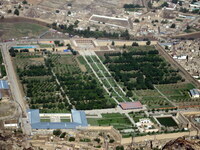 The remains of a garden survive by the River Kabul at Nimla but the site cannot be identified with certainty. What is known about its design also comes from Babur's memoirs: ""There oranges, citrons and pomegranates grow in abundance....I had plantains brought and planted there; they did vedry well. The year before I had had sugar cane planted there; it also did well.....The garden lies high, has running water close at hand, and a mild winter climate. In the middle of it, a one-mill stream flows constantly past the little hill on which are the four garden plots. In the southwest part of it there is a reservoir ten by ten, round which are orange-trees and a few pomegranates, the whole encircled by a trefoil meadow. This is the best part of the garden, a most beautiful sight when the oranges take color."